Councilman Ydanis Rodriguez, State Sen. Adriano Espaillat and State Assembly Nominee Carmen De La Rosa stood before 78-86 Thayer St. to call out on the vacant apartments inside the building. INWOOD — Empty apartments inside poorly maintained apartment buildings are challenging New Yorkers' chances of finding affordable housing at a time when they need it most, according to local elected officials. 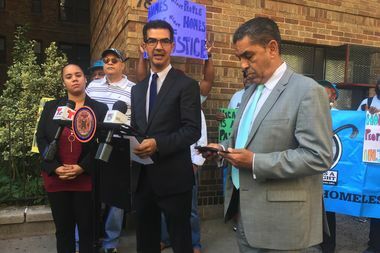 Councilman Ydanis Rodriguez, joined by state Sen. Adriano Espaillat and Assembly candidate Carmen De La Rosa as well as the organization Picture the Homeless, held a rally Tuesday to highlight how the abundance of empty lots and vacant apartments are threatening existing tenants and preventing those who need apartments from finding a place to live. The rally targeted 78 Thayer St. — which they say has kept nearly half of its 65 apartment units empty. They claimed the owners, listed on Department of Buildings records as the 78-86 Thayer Street Corporation, have been warehousing dozens of empty units as it prepares to flip the property into a co-op building. "This a matter of safety issue. This is a matter of health issues. This is a matter about protecting our working class and our middle class," Rodriguez said, adding that owners have been pressuring remaining tenants to move out. Representatives for 78-86 Thayer Street Corporation didn’t reply to a request for comment. Rodriguez is currently sponsoring a package of bills with Public Advocate Letitia James and Councilman Jumaane Williams — known as the "Housing Not Warehousing Act" — intended to keep track of empty units and hold landlords accountable to register these empty lots. The first bill, Rodriguez said in a statement, will mandate an annual count of all the vacant land and properties in the city, while the second, introduced by James, will mandate owners to register their properties as vacant or face fines. The third bill, introduced by Williams, will then keep a list of the vacancies and determine which is suitable as "prospective land for affordable housing development." Residents said trouble at 78 Thayer St., however, goes beyond the empty units and began more than a decade ago, when some tenants moved out and the repairs throughout the building dwindled. John Feliciano, who has been living in a 78-86 Thayer St. apartment for 16 years, said he’s taken his landlord to court in the past, but the problems continue — including a recent rent jump from $800 to $1,450. “They told me they want the apartment, regardless,” he said, adding that he can't endure it anymore. Rodriguez said his office is in talks with HPD on the Thayer building to take over the building and make the 65 units in the apartment building affordable — or keep the landlord accountable with a top-to-bottom inspection, and keep track of the current tenants while investigating why the previous tenants left their homes. HPD said the owners currently owe $475,000 to the New York City Department of Finance for back taxes, interest or other fees — as well as $12,000 in fees to New York City Department of Environmental Protection. "If the owner participates in one of HPD’s preservation programs, we would require that they enter into a regulatory agreement that would restrict rents, initial household incomes for new residents, and require rent stabilization, as well as other provisions," said HPD spokeswoman, Juliet Pierre-Antoine, adding that the agency is currently in the "initial stages of conversation with the owner to discuss possible preservation opportunities." Members of Picture the Homeless said the bills currently before the City Council are long overdue, adding that their team presented a similar bill – Intro 48 – in 2011 after canvassing the city and locating a lot of vacant properties across New York, spokeswoman Arvernetta Henry said. "City Council was saying there weren’t any vacant properties, and that’s why they had the shelters," Henry said. "But we found landlords and owners that had store commercial businesses at the bottom, and at the top they put curtains and air-conditioned units – but the units were empty."